This lovely was my first experiment with milk paints! 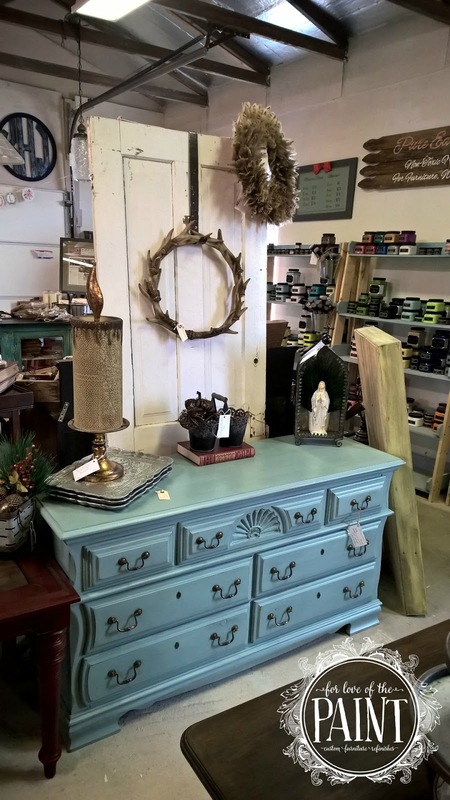 The dresser has gorgeous knotted pine exterior facings and a subtle nautical vibe with a carved seashell detail and curved side edges along the drawers. 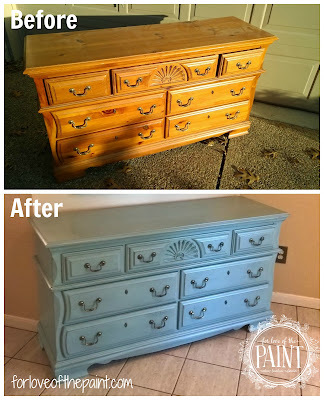 I wanted to highlight these without being too literal and thought I would try the chippy texture of a milk paint! I selected General Finishes Basil and Persian Blue - then realized quickly that this was nothing like the milk paint I had anticipated. It instead was a beautifully saturated, smooth and gorgeous color with all-over adhesion (We had also lightly sanded the entire surface). I probably would have done two to three coats to see the full expression of the color, but Basil was a little more of a light sage than I had expected, so I switched to layer it with Persian Blue. This brought out a gorgeous almost sea foam or sea glass color that started to speak to me. 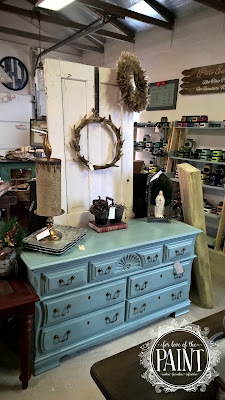 I wanted to also embrace the beautiful vintage texture and knotted pine on this piece, so I did a light all-over distressing, as well as a focused distressing at the natural wear points on edges, drawer sides, feet, etc. The texture was exceptionally smooth and I LOVED the driftwood-inspired finish. Thanks for reaching out! I wanted to respond here as well in the interest of thoroughness, in case anyone else has a similar question! Yes, this piece has been sold, but please feel free to check out my "Available Inventory" tabs on this page at any time, as well as my Etsy shop at www.etsy.com/shop/forloveofthepaint ! We are located just north of Austin, Texas :) Thanks again and have a great week!